Let me first state that I am not necessarily an advocate of marijuana. I don't use marijuana. Its simply not my drug of choice. I prefer wine and sugar, both of which are, lucky for me, 100% legal. That being said, I am am advocate of freedom. Freedom to medicate, choose, express yourself, engage in civil discourse, and of course, freedom of association. 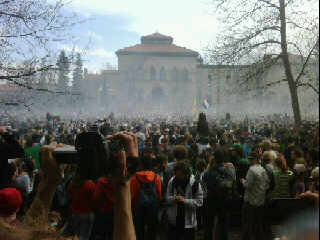 Which is why, I am highly disappointed and alarmed at CU's attempts to extinguish the annual 420 event. Here's CU's Norlin Quad on a regular old day. Boulder is somewhat of an anomaly. A liberal wealthy bubble of a town where organic rules and medicinal marijuana dispensaries are a plenty. 420 at CU has become quite an event, and represents a protest against federal, state, and municipal laws which prohibit marijuana use. Many attendees are gawkers, like me, or undergraduates, or advocates, or yes, even faculty. 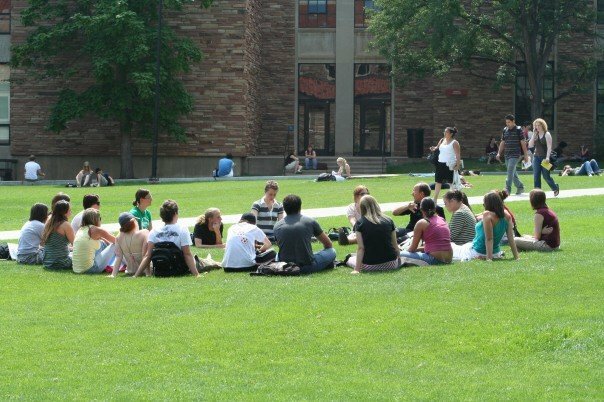 The event entails 1000's of people collecting on the grounds of Norlin, a beautiful open space on campus surrounded by historic buildings, where at 4:20 pm most (but certainly not all) people light up. Its a peaceful gathering where people inhale their legally or illegally obtained mary jane, which I should add is not a criminal offense in Colorado. And that's it. It lasts all of about 30 minutes. April 3 E-memo sent out campus-wide outlining that 420 is disruptive to learning and urging professors not to cancel or alter course schedules on that day. The message also promoted the free on-campus concert with Wycleff Jean, (who is known to be marijuana friendly), which will run from 2pm-6pm, and is incidentally sponsored by Coors. Oh, and apparently there will be extra security on campus issuing parking tickets. What?! So we should not accommodate 420, which is disruptive, but we should send students to a concert instead? What happened to learning? And parking tickets? Really?! April 13 E-memo # 2. I've pasted the entire letter at the bottom of this post. Highlights include campus being closed to all visitors and check points throughout campus requiring students, staff and faculty to show ID. Violators will be charged with trespassing. Also, Norlin is closed to EVERYONE and anyone entering the quadrant will be charged with trespassing, which is punishable with 6 months in jail and a $750 fine. 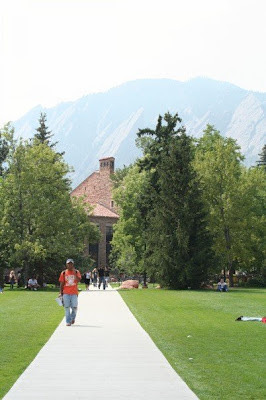 April 16 CU also announced its plans to disperse fresh fish fertilizer on the grounds of Norlin on the morning of April 20 as an added measure to keep people away. subject to a ticket for trespassing. a valid CU parking permit may park on campus. campus affiliation, who enters these areas will face a ticket for trespassing. Closure signage will be clearly displayed in this area. traveling to campus for BuffOne IDs and parking permits. -- Regent Drive will be closed to through traffic from approximately 1:30 p.m.
will be altered and/or delayed. Coors Events Center. Students attending the concert must be inside by 4 p.m.